Ford Chronicles: Weren’t You Hanging On My Wall? Luke Phillips’, Social Media Evolution: Or How I Traveled America Using Ford’s Credit Card blog series about his’ Ford journey ends with meeting a legend. If you missed the first parts of the journey, follow the links and we’ll be waiting for you when you get back! Over the hill and … wait, who’s that? As we played our sub-par pond hockey game, we were surrounded by a wide variety of people. You had the folks with cameras, the folks with instructions, and the folks with Ford jackets. And, they had all been lying to us. Well, not really lying per se, but withholding some juicy information! As we were taking the 10th faceoff in a row, the snowy hills behind the pond were awakened. As we turned around from our face-off, the 4th all-time winningest goalie in NHLhistory was making his way through the snow to the pond. I instantly recognized him as the man whose poster has been taped to my wall since I was a fetus. Curtis Joseph, or Cujo as he is known, played his first six NHL seasons in my hometown with the St. Louis Blues, coinciding with the exact years I began to love hockey. As part of the ‘adventure,’ Ford arranged for him to surprise us in the middle of playing pond hockey and hit the ice with us. Though Cujo spent a fraction of his career with the Blues, he left an impression on St. Louis that remains to this day. Hearing Ken Wilson shout, “And here comes Cheveldae!” brings memories of the Norris Division rivalries that the Blues had with the Detroit Red Wings back to any Blues fan. Some will recall the 1993 night that Cujo earned his stripes, when the Toronto Maple Leafs tried to take his head off. Multiple times. “Need a goalie?” Cujo continued, already dressed in full goalie gear. We were about to hit the ice with a living hockey legend who was going to make us look worse at hockey than we already were. 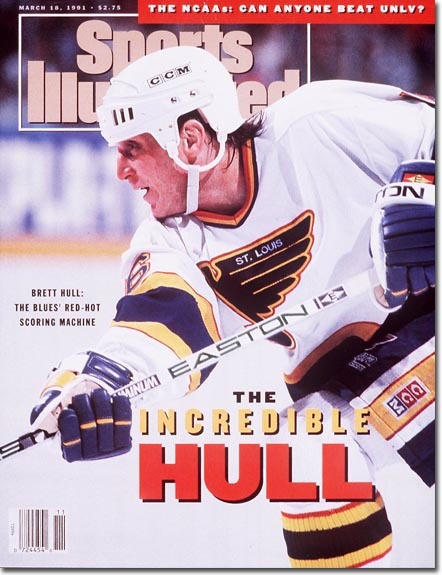 Mike Keenan was the St. Louis Blues head coach in the mid-nineties. Ask any St. Louis Blues fan about the Mike Keenan era, and you will evoke a variety of responses. They vary from tears, to anger, to bewilderment. Along with a flurry of other ill-conceived trades, Keenan traded Curtis Joseph to the Edmonton Oilers. 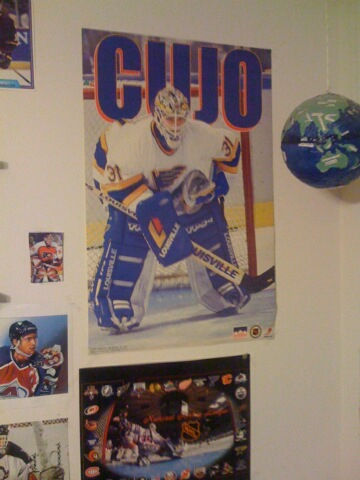 Cujo never wore the Bluenote again, which devastated every St. Louis native. When I asked Cujo about the period of time most Blues fans would prefer to forget, he remarked, “We had a great thing going there. Then Mike Keenan came along.” He emphasized that with a roll of the eyes. Cujo said that, in his opinion, Keenan wanted to show he could win with his “own” team, not a team he inherited. It should be noted that Keenan failed miserably and was eventually fired. In about 3 seconds flat, the whole conversation had moved from, “Holy cow, you’re Curtis Joseph!” to simply talking about hockey with your buddies. It turned out he even lived near us in the early 90s. During his career, Cujo was widely known as a great person who would give his time to anyone – and every bit of it is true. We were so deep into conversation that the camera crew had to yell at us multiple times to get back to playing pond hockey. We did manage to pot a few against Cujo. After David, Nitin and I finished a series a slick passes for an easy goal, Cujo called us “The Rent-A-Powerplay.” He exacted revenge on me during the next break in shooting. Drinks were passed around, and after we took our swigs, we realized Cujo was the odd-man out. “Ah, no thanks.” He put his hands up in the air and then pointed at my lip, “I don’t want that, looks like you’ve got the herp or something there.” Everyone burst into laughter. My childhood hero had just made fun of me in front of my best friends. Greatest. Trip. Ever. Can You Possibly Make This Even Better? Oh … you can? After the shooting wrapped and it was time for lunch, Curtis stuck around and ate with us. As he munched on his sandwich right next to me, I found that it’s hard to eat when your jaw keeps hitting the floor. Curtis was expected to head back to his trailer (yes, a movie star trailer) to eat lunch, but true to his humble nature, he declined and ate with us and the crew instead. Curtis was wearing brand new goalie gear, and we asked if it was his. As it turns out, his personal gear was delayed in customs coming in from Canada the night before the shoot and wasn’t going to arrive in time. The production team scrambled to find gear for him to wear, and it was determined that they only solution was to head to the hockey shop and buy brand new gear. Every last piece of it. Ask us (or even better, our parents) about the cost of goalie equipment, and we’d give you a few horror stories about forking over at least $1,000 … just for the leg pads. So, buying all new equipment for Curtis was a sizable bump in the road for Ford. Or, so we thought. We nonchalantly tossed a hypothetical softball at one of the producers about the equipment’s future. And that was that. Handed over to us was $2,000 worth of hockey equipment , used for two hours by a future Hall-of-Famer. After making sure that our collective legs weren’t being pulled, we divided up the equipment amongst ourselves, every one getting a couple pieces of the gear for themselves. I ended up with the stick, goalie pants, the jersey, and the shirt he wore underneath all of the equipment. Yes, the actual shirt he was wearing. Don’t judge me. Luke wore Cujos sweaty undershirt whole writing most of the blogs. He claimed he had washed the shirt and the stench was his own, but we’re not sure. Luke will continue to give you interactive marketing insight in our blog, so you’re going to want to bookmark us. As soon as he changes his shirt.